After winning the British National Championships at a massive hulking presence, Zack really set a new standard for freak mutant size. He achieved this size in part to his fairly regimented daily diet plan that contains a massive amount of calories. If you want to look like Zack, here are his basic diet menu tips to follow on a regular basis. Tip 1 - Try to consume 6-7 meals per day eating every 2-3 hours. Tip 2 - Try to hit a target body weight every 3-4 days. If no changes are seen, make adjustments. Tip 4 - Excellent sources of protein range from grilled chicken breasts, turkey, beef/steak, fish and protein powders. Tip 5 - It is OK to add fruits to your diet in moderation. Keep it fresh and new rather than bland. 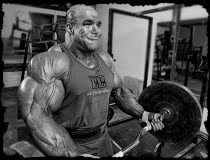 Without question one of the strongest and most intense bodybuilders around, Zack can handle large amount of weight for high reps to build his freakish physique. He combines a variety of training styles and approaches to keep pushing his weight limit to the max. Famous world over for his high-intensity workout sessions, here's a popular split he likes to follow.